The existing toilet may be old-fashioned, cracked, or stained. It may be either unserviceable or unsightly. Thus, you’ll want to replace the entire toilet. You can pick up an inexpensive toi­let, with all the internal plumbing installed and ready to operate, for under $75. Of course, for that price you get only a minimal unit. Often the toilet is smaller than one you would like, and the flushing action may require more water than many of the new water-saving models. However, this minimal toilet, usually available only in white, is quite serviceable, and many people can’t really tell the difference between it and a more expensive toilet. A deluxe toilet can be quite expensive—as high as $1000 and more—although most cost under $500. Typically these have unusual shapes, colors, and moldings, and their flushing action is excellent. 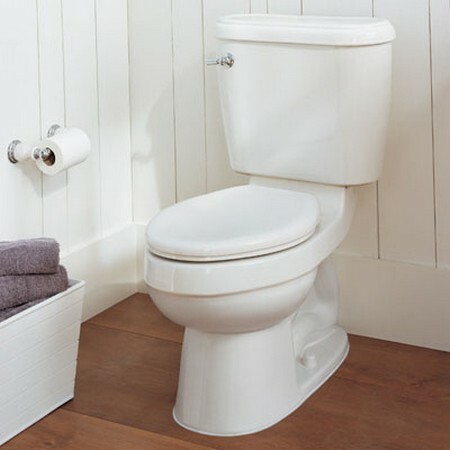 If you’re doing a major bathroom renovation, you will definitely want to consider a deluxe toilet. Keep in mind, however, that the inner workings and handle are frequently not included with the unit, but must be purchased and installed separately. A gold-plated handle alone can cost $50 or more. Although most people suppose that a toilet is difficult to install, it is actually the easiest of all the bathroom appliances. It is held in place by only two bolts, which attach to the upper flange of the sewer pipe, level with the floor. Simply remove the old toilet, cleaning away all the old wax seal. Put the new one in place, being sure to seat a new wax seal properly and getting the two screws (always use new screws) coming through the holes in the toilet. Then tighten the screws (not too far; you don’t want to crack the porcelain). When removing an old toilet wax seal, there’s a good chance you’ll get some effluent on your hands. To avoid a rash or even a severe infection, be sure to use plastic gloves. If the tank comes separate, place it on the toilet bowl supports, insert the thick rubber washer in the drain hole, and then tighten the two screws that hold the tank on. For the water supply, use metal-sheathed flex-hose of the correct length. The entire hooku barring problems, should take less than an hour. Be sure to measure the footprint of the old toilet. Virtually every model has a different foot­print. 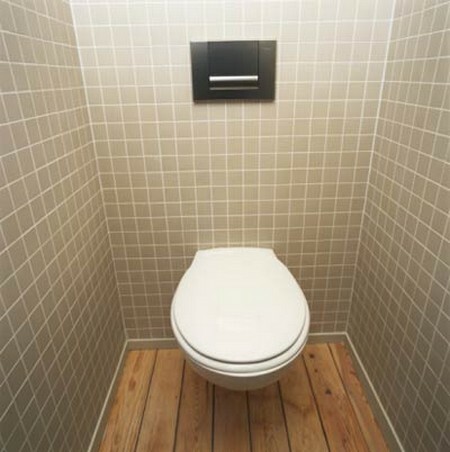 If you aren’t installing a new floor, you want to get a new toilet that has a larger footprint than the original, so that it will cover any rough flooring area. If the footprint is smaller, some of the subflooring may show around the base. ML Sometimes the two screws holding the old toilet to the sewer flange are rusted and will not unscrew. Since you are going to dump the old toilet, you may want to cut off the screws with a hacksaw or break the toilet porce­lain around the screws, making them easier to get out. If you break the porcelain, watch out for razor-sharp edges that could cut you. Be sure that the flange from the sewer line, to which the toilet attaches, is in good shape. This flange bolts onto the floor. If it’s damaged (so that you can’t get new toilet bolts onto it), you’ll have to replace it. Simply cut through the line below the flange. Then glue on a union, a new piece of pipe, and a new flange, which you will attach to the floor. With older metal pipe, the procedure is much more difficult and you may want a plumber’s help. You’ll probably want to convert to plastic pipe, using a pressure clamp fit­ting over the old pipe. Or you’ll have to install a new flange using old cast-iron pipe, tamping in hemp, and then filling with liquid lead. This is a tricky operation and is rarely done today because of the danger of lead poisoning from the fumes. Be sure the toilet bottom is flush with the floor. If it is uneven, tightening the toilet even slightly could cause it to crack. Also, if it is uneven, the toilet will wobble when someone sits on it. When tightening the tank to the toilet bowl, be sure to use the rubber grommets that come with the bolts. They go inside the tank and ensure that water doesn’t leak out around the fitting.